DONETSK, Ukraine -- One day after Ukraine elected a new president, the Ukrainian military launched air strikes against armed pro-Russian separatist rebels who seized the Donetsk International Airport, an official there tells Fox News. 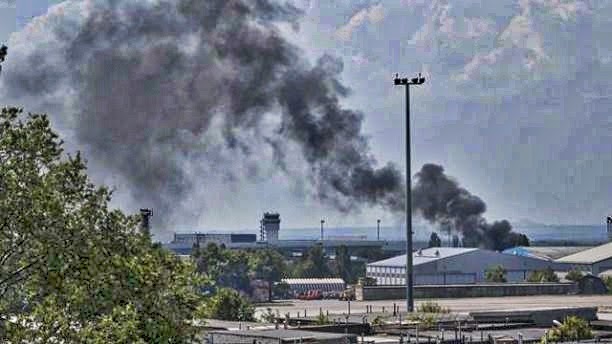 A bombardment of the airport reportedly began shortly after noon local time, and black smoke could be seen rising from buildings following the sounds of shelling. A firefight broke out after the Russian rebels seized the main airport, just as Petro Poroshenko was elected in a landslide victory on Sunday. Poroshenko, during his first remarks after the vote count, likened the armed separatists in the east to the lawless nature of “Somali pirates,” The New York Times reported. Vladislav Seleznyov, a spokesman for Kiev's anti-terrorist operation, wrote on his Facebook account that the military presented an ultimatum earlier this afternoon to unknown armed men who had occupied the airport to lay down the arms. He said the gunmen didn't comply and the military launched an air strike. Police blocked access to the airport. Hundreds of pro-Russian militia have seized government buildings and fought Ukrainian troops for weeks as their leaders have declared independence. The airport’s press service reported that several dozen armed men from the Donetsk People’s Republic had arrived at the airport at about 3 a.m. and ordered the removal of all Ukrainian military and security personnel, The Times reported. No violence was evident at that time. Flights at the airport were temporarily suspended, but the airport statement said the rebels were not in control of any flights. Meanwhile, Ukraine's new president-elect wasted no time Monday focusing on the top issues at hand -- promising to negotiate an end to a pro-Russia insurgency in the east and saying he was willing to begin talks with Moscow. Russia quickly welcomed the offer from 48-year-old chocolate magnate Poroshenko, raising hopes that his election will indeed ease the protracted crisis that has fueled tensions unseen since the end of the Cold War. But the airstrikes Monday against the separatists suggests that fighting in the east is far from over. International observers, meanwhile, hailed Ukraine's presidential vote as a "genuine election," saying it was held freely and fairly. Secretary of State John Kerry said Monday that the election sent a "clear message" to Russia. "The Ukrainian people want to live in a united, democratic and peaceful Ukraine anchored in European institutions,” Kerry said in a written statement, adding, "The successful conduct of these elections reaffirms Ukraine’s commitment to the democratic process." Poroshenko, known for his pragmatism, supports building strong ties with Europe but also has stressed the importance of mending relations with Moscow. Upon claiming victory in Sunday's vote, he said his first step as president would be to visit the Donbass eastern industrial region, where pro-Russia separatists have seized government buildings, declared independence and battled government troops in weeks of fighting. The tycoon looked decidedly cool and composed Sunday night when the exit poll results were announced. On Monday, he got emotional when he was asked about the crisis in the east. "The anti-terrorist operation cannot and should not last two or three months," he said. "It should and will last hours." The military operation has caused civilian deaths and destroyed property -- angering many eastern residents -- while still failing to crush the rebellion. On Monday in Donetsk, a major eastern city, heavy shelling was heard from the airport. Fighter jets and military helicopters were seen flying overhead, and dense black smoke rose in the air. Denis Pushilin, a leader of the separatists, said they had sent their men to the airport after some of their supporters were detained. "We are ready for dialogue with representatives of Kiev, with Petro Poroshenko," Lavrov said at a briefing, adding it was a chance that "cannot be wasted." He emphasized that Moscow saw no need for any involvement by the United States or the European Union in those talks. "We don't need any mediators," he said pointedly. Lavrov also noted Russia's longstanding call for the Kiev government to end its military operation in eastern Ukraine. The rebels had vowed to block Sunday's voting in the east. Less than 20 percent of the polling stations were open there after gunmen intimidated residents by smashing ballot boxes, shutting down polling centers and issuing threats. But nationwide, about 60 percent of Ukraine's 35.5 million eligible voters turned out Sunday, and long lines snaked around polling stations in the pro-Western capital, Kiev. Joao Soares, special coordinator for the OSCE observer mission in Kiev, hailed Sunday's vote and "a clear resolve of the authorities which resulted in a genuine election largely in line with international commitments." "Ukrainian authorities should be commended for their efforts in the extraordinary circumstances to facilitate an election" which was held in parts of Ukraine's volatile east, Soares said. He said monitors did see multiple threats, intimidation and abduction of election officials in the east, which is overrun by pro-Russian militia. With votes from 75 percent of the precincts counted Monday, Poroshenko was leading with about 54 percent in the field of 21 candidates. Former Prime Minister Yulia Tymoshenko was running a distant second with 13 percent. If those results hold, Poroshenko would avoid a runoff election next month. Election officials said official results would be announced by June 5. Since his ouster in February, Russia has annexed the Crimea Peninsula in southern Ukraine, the eastern regions of Luhansk and Donetsk have declared their independence from Kiev, and the interim Ukrainian government has launched an offensive in the east to quash an uprising. The interim Kiev government and the West have accused Russia of backing the separatist uprising. President Barack Obama praised Ukrainians for participating in the voting "despite provocations and violence." Obama said the U.S. supports Ukraine's sovereignty and territorial integrity, rejects Russia's "occupation and attempted annexation of Crimea" and is eager to work with the next president.